Today the Most Reverend Liam Cary will be ordained a Bishop! Father Cary is the priest that provided most of our marriage preparation and married Hubby & I back in 1999! I had so wished that we would be on our way to the ordination right now... However, Hubby's work schedule has been overwhelming lately and he ended up needing to work today after all, so we had to cancel our hotel reservations. The trip would have been just too hard for me to make on my own with all the kids, though the idea did cross my mind! Instead I just put a "Bishop's Cake" in the oven and we will be watching the livestream (also available here at CatholicTV.com at additional times) of the Ordination online, beginning at 1:30pm. Isn't technology amazing!?! After the ordination we will offer a rosary for the new bishop and have our own little reception! Please say a prayer for the new Bishop of Baker! that they may govern her wisely and bravely. We also will be watching it. We wanted to go also,but didn't work out. Isn't that picture from the Ad Limina visit to Rome recently? Father Liam is amazing. . . we are sad that he is no longer at St. Mary's but thrilled for this new venture in his life. Funny how, even states apart we all share connections! You have been blessed there at St. Mary's! Father Anderson is still there, right? He is an amazing priest as well! How lovely that the priest who married you is now your bishop! Where will Bishop Vasa be going now? He married my husband and I 20 years ago and brought me into the Church. Bishop Vasa has been the Coadjutor Bishop of Santa Rosa, CA for a little over a year now, I believe. I sure wish Bishop Cary was going to be our Bishop, but unfortunately we do not live in the diocese of Baker. We are still waiting (and praying!!) to hear who will be taking our own Bishop's place following his retirement this summer! I considered making the trek to Bend for the ordination too, with my 6 kids. But, it wasn't prudent. =) We enjoyed watching the livestream though. Can't wait to meet Bishop Cary - again. I had the privilege to travel to WYD in Paris with him in 97. May God bless and protect him! And in the background is Bishop Carl Mengling - the retired Bishop of Lansing, MI - he celebrated the Confirmation Mass in our parish (St. Patrick's - Seneca, IL) in 2011 and gave the homily at the funeral Mass of our beloved pastor in Janaury. 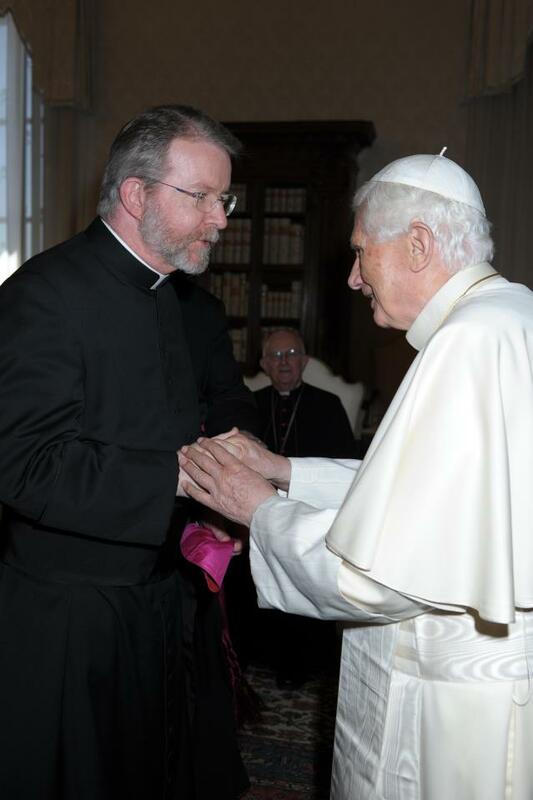 You could be right about Bishop Mengling in the background, but I thought it was Archbishop John Vlazny from Portland, as Bishop Cary was traveling with the bishops of the NW for their ad limina visit in April. Praying for all our bishops. Yes Karina, it is Archbishop John Vlazny on their Ad Limina visit.